Financial Performance presents the foundation concepts underlying the Senior Executive Programmes the Authors have taught together and separately over the last 15 years in Europe, Asia and North America. The book is intended as a reference manual as well as a textbook and will be of value to anyone with an interest in financial performance - particularly senior executives. The developments in modern finance over the last two decades have considerable implications for the way senior executives think about the finance discipline. It is no longer enough to have a rudimentary knowledge of basic finance and a heavy reliance on financial specialists. CEOs of course need excellent financial professionals - however they need to go beyond this and provide strategic leadership. This requires a conceptual framework for dealing with financial matters. This book provides a description of the underlying ideas and will be of value to anyone with an interest in financial performance - particularly senior executives. This book revolves around the concept of value and it is organised into two parts. Consists of three chapters, all of which focus on the real and fairly complex set of financial statements of DaimlerChrysler AG. The first two chapters provide a detailed guided tour of the financial statements which deconstruct the complexity and then reconstruct the financials to provide a clearer base for analysis. These chapters have been arranged to deal with each line item of financial statements which have been highlighted in such a way to allow the reader to treat the materials as a reference as well as a sequential read. Chapter three presents a framework for evaluating financial health and introduces a cash flow based model for understanding the short and medium term constraints on a firm's growth. This exposition revolves around the concept of sustainable growth. 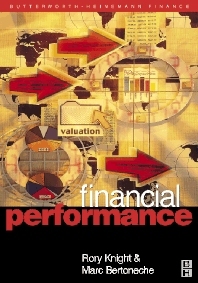 In the second part of the book chapter 4 introduces the cost of capital concept followed by chapter 5 which provides a general source of reference for valuation and a variety of difference applications.Chapter 6 concludes the book with a review of concept of shareholder value from a European perspective. For the last five years Rory has been Dean of Templeton College, the University of Oxford's business college. During this time he led the Oxford Advanced Management Programme and he created the Oxford Senior Executive Finance Programme. He has considerable experience in business and management development. He is actively involved in briefing the senior executives of leading companies on issues in Finance and Strategy. Prior to coming to Oxford Dr Knight was the deputy director of a foundation within the Swiss National Bank (SNB) and previously a Professor in Finance at IMI, Geneva & IMD, Lausanne. Marc is a Professor in Business Administration at the University of Bordeaux and has been on the faculty at INSEAD, the European Institute of Business Administration in Fontainebleau France for more than twenty years. His areas of interest include corporate and financial strategy, mergers and acquisitions, venture capital, financial markets, corporate ownership and governance, risk management and international finance. He is currently visiting professor at the Harvard Business School. Marc and Rory have worked as a team for over fifteen years in teaching senior executives and academic research. Dean Emeritus, Templeton College, University of Oxford.Prior to coming to Oxford Dr Knight was a deputy director of a foundation within the Swiss National Bank (SNB) and previously a Professor in Finance at IMI, Geneva and IMD, Lausanne. Professor in Business Administration at the University of Bordeaux and has been on the faculty at INSEAD, the European Institute of Business Administration at Fontainebleau France for more than twenty years. Currently visiting professor at the Harvard Business School.